William Albert "Alfred" Johnson, son of William Edward & Mary (Raley) Johnson, was born on November 20, 1871 and died on February 18, 1957. He married Mary Adeline Adams. William's second wife was Lula Elizabeth Wathen. She was born on June 21, 1896 and died on January 9, 1989. William is buried in the St. Aloysius RCC Cemetery in Leonardtown, Maryland along with Lula Wathen. I do not show a listing for Mary Adams. 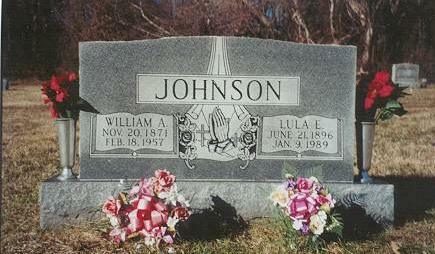 Parents of Lula were John T. Wathen & Margaret Edwards Wathen. While living in St. Mary's County Lula worked at the powder plant located at the corner of Friendship and Three Notch road. After her husband died Lula Johnson worked in Washington D.C. She moved into the same apartment complex as William Alfred & Mary Etoyle Johnson and cared for their children. Pallbearers at Lula's funeral were: Willie A. Johnson, John R. Bowles, Jr. Robert T. Oliver, Ricky M. Johnson, Alan J. Johnson and Toney E. Wheatley. Alan J. Johnson tells me that because there was a 25 year difference in age between Lula and William her brothers frowned on her marriage. To elope they had to cross a river with the two brothers in hot pursuit!